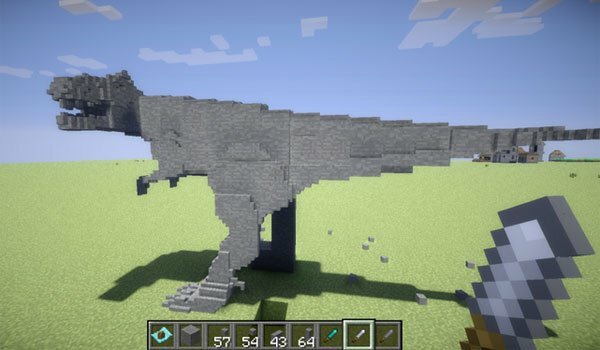 Paint, or sculpt your own creations in Minecraft. Mine Painter 1.7.2 and 1.7.10 is a mod that consists of two functionalities. The first function is sculpting everything that goes through your head , ” eliminating pixels ” of any blocks or adding them . That is similar functionality that Little Blocks allows to do, with the difference that here we can also play with the miniplugs , bars and layers of each block. For this we use 3 types of chisel added in this mod, the stone, iron and the diamond one. Each one allows you to select a different area of each block to work it and give it the shape you want. Besides this, the mod adds the painting functionality. We will use special fabrics that hang on the wall using a brush and paint can go as we please , frame by frame or hub to hub. The colors we use are the colors that exist for Minecraft dyes . To erase parts of the drawing will use Bonemeal . How to install Mine Painter Mod for Minecraft 1.7.2 and 1.7.10? Sculpts and paints in Minecraft!